You know there’s a squillion fonts out there. How do you choose? Just pick something you like? However, it’s super important to keep in mind a number of things. Like, WHAT’S IT GOING TO BE USED FOR? If you’re going to write a simple document for instance, there’s no need to get fancy. You can create hierarchy in text easily with a single typeface; just using all caps, italics, bold, and varying the size will be all that you need to do. When it comes to branding however, you’ll need something a little bit fancier. Consider this too: if you don’t have a logo as such, you can absolutely use your biz name in a particular font as your logo (Myer does this; so do lots of other companies). The first thing to consider is all the places you might be using that fancy font – business cards, shop banner, website, packaging, letterheads, … the list goes on. Now, some fonts are so fancy that they become difficult to read – so where and how it’s used has a big impact on what you should choose. When it comes to website headers or shop banners for instance, readability becomes less important. But if you’re including contact details or technical information… well, you want people to read that easily, don’t you? There are heaps of free fonts available from numerous sites. Here’s a few, but there’s plenty more – www.dafont.com, www.1001freefonts.com, www.fontsquirrel.com, fontfabric.com. There are a couple of things to watch out for if you’re getting a free font. The number one thing is to check the licensing conditions, as they vary from font to font and designer to designer. Some fonts only come with a free licence if you’re using them for personal use (birthday party invites and the like) but won’t allow commercial usage (which is what you’ll be wanting if you’re using it for your business). Also, watch out as some fonts are only offered as samples and don’t have the whole character set – very annoying, if not impractical. Look not only for missing letters, but also for punctuation, accented letters, fractions, etc. Some designers might forget characters because of inexperience, or because they’re simply slack, or even because they want to get them onto the free sites as an advertisement to get you to buy the full set. If you want one of the free fonts spend some time filtering through and reading the licence conditions and get those with a commercial or open source licence if you want to use them in your branding. You can also make your own font from your handwriting if you like. Try these sites such as www.myscriptfont.com or www.paintfont.com. When you buy a font from a designer, you’re not only supporting another artist, you’re generally making a leap in quality. There is a much wider array of styles to choose from, and you’ll most probably get a font family – variations on the central font, which can be useful when creating a hierarchy in your text (headings, sub-headings, etc. And you’ll usually get all the characters). There are often also subtle differences in quality, like the kerning (space between each letter) and the size of various elements within each letter, which has a big impact on readability and making the font lovely to look at. OK! Now down to the nitty gritty. 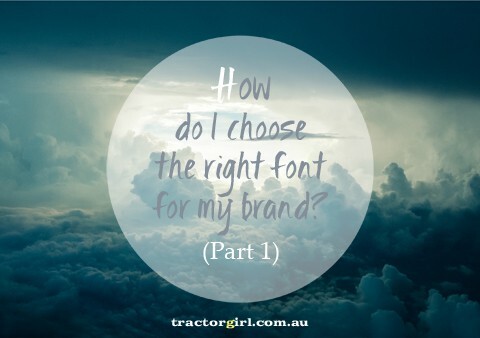 How do you match your font to your biz? Of course, it’s all to do with aesthetics. Firstly, be wary of following the latest trend – they may have a short life span and can quickly become dated-looking. That’s OK if you’re using them for short term things (e.g. ads), but you don’t really want to throw out those 500 business cards you just bought last month, now do you? So beyond issues of readability and trendiness, it comes down to choosing something that you like that ALSO fits with your biz personality. Briefly, there are several style groupings for fonts, including text fonts (those that are used for everyday writing, and are designed for maximum readability – e.g Arial, Times New Roman, Helvetica) and display fonts (these are the fancy ones for headings). Big fat fonts with square ends are called slab fonts, and look masculine and modern. Script fonts are slanted and flowing like old-fashioned handwriting – they look elegant and timeless. Handwritten script fonts mimic modern handwriting, and are pretty casual. Condensed fonts (those that look tall and squished) are more tough and authoritative, and of course there are those super-fancy fonts that are a heap more expressive. For instance, curly and uneven convey whimsy; and there are those that refer to things we’re already familiar with like cowboy-style Western, starship-enterprisey space age, or fat 70s groovy. There’s heaps to cover (including what not to do) and I’d like to do that justice without making this post overly lengthy, so I’ll go into more depth comparing different styles in next week’s post. But while you’re waiting, check out these great infographics I found on FastCoDesign – especially the section at the top identifying some of the different typefaces, and the “What’s it Saying” section – (and yes they’re not perfect and they do come in for a bit of criticism in the comments, but they’re still a great introduction). If you’ve got any burning questions on fonts, I’d love to hear them! Besides a deeper analysis of styles next week, where I’ll also talk about how the little touches can make all the difference, I’m also planning a post on pairing font styles for your biz, so stay tuned for that too. Great post Julie! I love your reference to not being too trend driven for a brand – excellent advise. Thanks Cordie! Yep, there’s always a case for being fashionable, but it’s equally important to not let that be your only driver because it results in chaos and sends badly mixed messages to your audience.